Ulli Karam Dosa is a delicious Dosa topped with a spicy onion chutney spread. When you are serving to kids, you can make it more interesting by adding cheese. When I was thinking about what to make for U, I remembered the Telugu word Ulli for Onions. I was thinking if I should search for something else as the only other option I had on hand was the Uppu Huli Dosa. I finally thought this spicy chutney will surely be a great addition to my dosa collection. This Ulli Karam is made with regular Dosa batter and made more interesting by adding cheese. Andhra cuisine is full of recipes with different spreads. Athamma is quite famous for the different spreads that she makes with onions, green chilies or tomatoes. Depending on her moon, the spread gets changed. Right from Erra Karam, Putnala Podi, Ripen Chilli Spread, to Spicy Green Chili spread to Tomato spread. Cooking all these makes the difference. She mostly uses an iron cast tawa for roasting the ingredients. The result is, the ingredients tend to be smoky and that adds to the overall taste. Remembering all these, I decided I would make this recipe and seeing it had cheese I knew kids will love it. When I planned for this Dosa, I had Jini Dosa on cards as well. Between the two, both Konda and Peddu loved this Ulli Karam better, maybe because it was more spicy and cheesy. Of course, the Jini Dosa also had cheese in it. But with adding the sweet and sour sauce, maybe it wasn’t as spicy as they expected. Whatever may the reason be, I had to make it again for their school packed lunch. So what more can I ask for! Finally, for U, it is Ulli Karam Dosa with Cheese in the AtoZ Flatbread and More, where I am doing AtoZ Dosa Varieties. 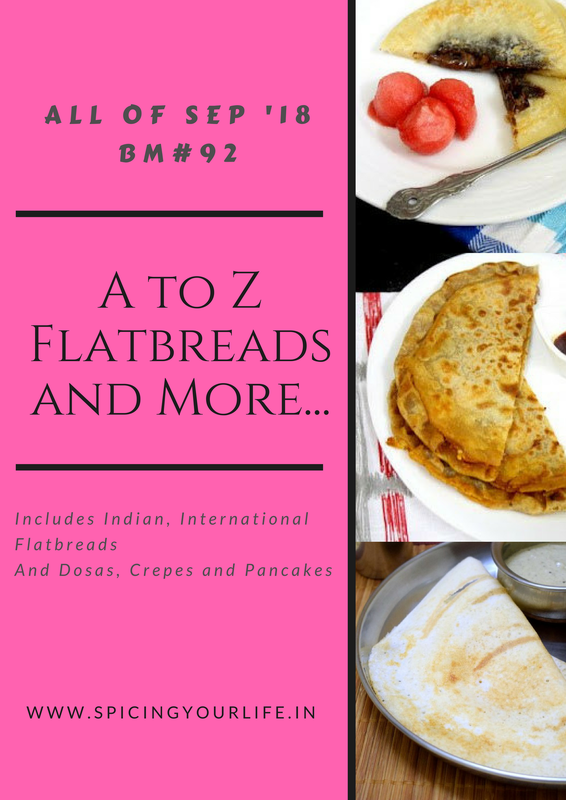 If you want to know what’s U in the AtoZ Indian Flatbreads, hop over! Heat a nonstick pan with oil. Roast all the ingredients till done and allow it to cool down. Grind into a paste and keep aside. Heat a tawa and grease well. Depending on the tawa, you can season it. Reduce to medium flame, and pour a ladleful of batter and spread into a circle as you normally make. Drizzle oil over it and cook on both sides. Take a spoon of the chutney and spread on top. Next grate the cheese over it and add finely chopped coriander leaves. Fold over it. Next, grate the cheese over it and add finely chopped coriander leaves. Fold over it. After seeing so many delicious, lip smacking dosas, I’m tempted to try all one by one and finding it very difficult to wait till mega marathon is over. Bookmarking all your dosas to try asap. My mouth is literally watering here. What a droolworthy ulli karam dosa, absolutely crispy and very delicious to resist. Cant ask more. Makes me hungry. I heard this ever so popular ulli karam dosa has had some interesting variations on the streets of hyderabad and here I see a variation!! Stunning Valli. I am a great fan of Dosa’s and make them at least once in a month , that’s the time I make a complete spread , and look for variations . I am sure this Dosa with onion chutney and cheese would be loved by all . I am drooling over this crisp and cheesy dosa which simply doesn’t need an accompaniment . Never tried such type of dosa… looks so fantastic.. with masala which you spread over dosa. Another interesting version of dosa from you Srivalli, amazed at your research skills. Who wouldn’t love cheese on the dosa? With onion chutney, you have me drooling. Ulli karam dosa looks interesting. that chutney really looks delicious and yum,. adding cheese to any recipe makes it so tasty and kids enjoy. surely kids will love this cheese dosa. Oh my! I am seriously drooling here. This one looks very inviting and I will make a less spicier version for the kids.I know they will love it ,if not for anything else, the cheese will do its job!! That is just layer after layer of yumminess. Looks amazing and with the cheese, my boys would love this to the core.